How Many People Abuse Them? Antidepressants are prescription medications used to treat depression, anxiety and other mental health conditions. People may abuse antidepressants for their stimulant-like effects. 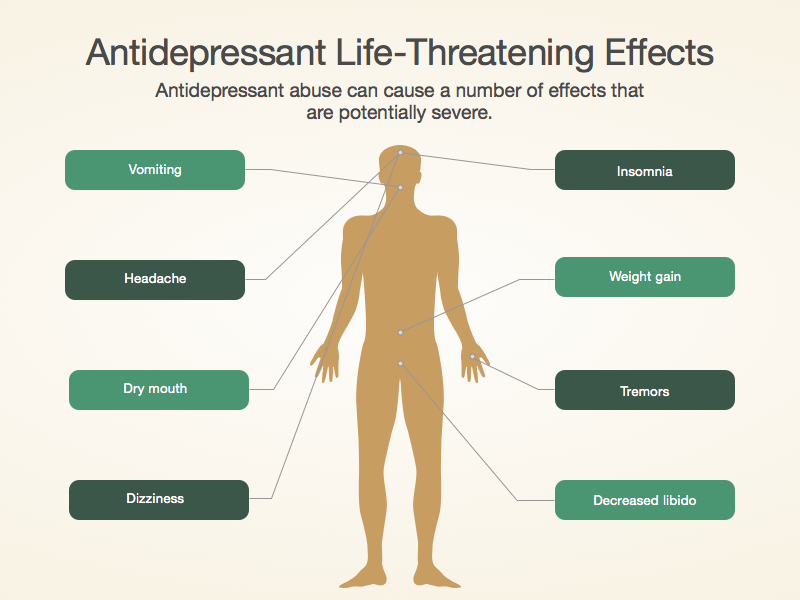 Side effects of abusing antidepressants include seizures, cardiac arrest, hallucinations, irritability and aggression. Signs of an antidepressant addiction include continuing to use despite negative consequences, using in dangerous situations, taking larger amounts than intended and cravings. Antidepressant abuse is on the rise in incarcerated populations. It is also on the rise among teens, who may see prescription drugs as safer than street drugs. People can become addicted to antidepressants if they take them inappropriately and in higher doses than prescribed. It can be very difficult to overcome this condition without substance abuse treatment because severe and life-threatening withdrawal symptoms may occur when the person stops taking the drugs. Antidepressants are not addictive or dangerous when taken as prescribed. They have helped millions struggling with a number of mental health issues. If you’ve been prescribed antidepressants, be sure to follow your doctor’s instructions and to ask him or her if you have any questions. The most commonly prescribed forms of antidepressants are selective serotonin reuptake inhibitors (SSRIs). They act on a neurotransmitter in the brain called serotonin, which helps regulate pain sensations, mood, sleep patterns, digestion and mental clarity.3 SSRIs increase the amount of synaptic serotonin in the brain. Many disorders such as depression are thought to be caused by a clinically low presence of serotonin. How much you pay for a rehab program will depend on the type of program, its location, how much your insurance will cover and its features. Inpatient programs, luxury programs and programs in nice locations, such as near the beach, tend to cost more. Do you have insurance? Speak to a treatment support specialist at to learn more about what your insurance will cover. Do you need to pay out of pocket or finance your treatment? The Substance Abuse and Mental Health Services Administration’s helpline can direct you to low-cost rehab options in your area. Outpatient rehab. These programs do not require you to live at the treatment facility but may not provide the level of care and supervision of an inpatient program. Inpatient or residential rehab. These programs are more intensive and usually offer medically supervised detoxification, medical care, an individualized treatment plan and group and individual therapy. 12-step programs. These are free, peer-support programs where you support other people with substance abuse problems while working through the 12-step recovery program. [/link] Pills Anonymous helps people struggling with prescription drug abuse. Dual diagnosis treatment facilities. These programs can help with any other issues you may be struggling with in addition to antidepressant addiction, such as depression or anxiety. Get more information about choosing a rehab program. People who abuse antidepressants may consume high doses, snort the pills or inject them. People who abuse antidepressants often consume high doses of them (several pills) for the stimulant effect. But they may also crush the pills and snort them or mix them with liquid (e.g., water) and then inject them into veins.4 Snorting or injecting antidepressants speeds up the onset and intensity of the effects. But it also increases the risk of addiction and can lead to confusion, seizures or psychotic symptoms such as hallucinations. SSRI antidepressants, in particular, can disrupt the various functions that the serotonin neurotransmitter regulates and can cause a number of side effects. When antidepressants are abused above and beyond the prescribed dose, individuals can experience even more severe, if not life-threatening symptoms. Most of the side effects may go away after addiction treatment. But some of the effects may last longer depending on how long the person abused the drug. Altered cognitive and social skills. Problems at school, work and/or interpersonally. Increased stress within personal or martial relationships. Excessive absences from work or school. Taking antidepressants in larger amounts than intended. Failed attempts to cut down use or to quit. Excessive amount of time spent obtaining, using and recovering from the effects of antidepressants. Intense craving to use antidepressants. A loss of interest in hobbies or attending social events. Continuous abuse despite negative consequences. Repeated use in physically dangerous situations, such as driving or operating machinery. Continued antidepressant abuse despite worsening physical and physiological symptoms. Needing a higher dose to experience an effect (antidepressant tolerance). Antidepressant abuse can lead to tolerance and using the drug to avoid withdrawal symptoms. If antidepressants are taken inappropriately (to get high) and in large amounts, the brain may begin to adapt to this medication. The stimulant-like effects will diminish over time, and the user will develop tolerance, which means they will need to take higher doses to achieve the intended effects or high. As mentioned, those who try to abruptly stop taking antidepressants may suffer from withdrawal symptoms and the worsening of certain health problems.5 Many continue using the drugs to avoid withdrawal, which may lead to an antidepressant addiction. Many antidepressants cause withdrawal symptoms if they are discontinued abruptly. These symptoms may occur within a few days to a few weeks after the person quits taking them. The chance of experiencing withdrawal effects varies with each medication. Talk to your doctor about tapering off gradually or seek help from a treatment center if you feel you are suffering from an addiction to antidepressants. Additionally, antidepressant abuse appears to be growing in the adolescent population (see “Teen Antidepressant Abuse” section below). Taking larger amounts of antidepressants than prescribed or combining them with alcohol, marijuana or other drugs can lead to an overdose. Potential signs of an antidepressant overdose include the following. These types of symptoms can become life threatening within an hour of onset. If an overdose is suspected, call 911 or go to an emergency room immediately. A dry mouth and skin. 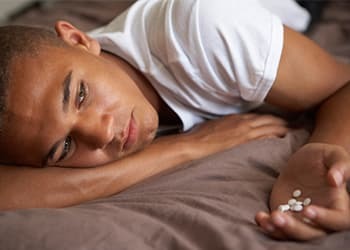 Antidepressant abuse in teens is on the rise due to the stimulant-like qualities produced by high doses and the ease of accessibility. Additionally, many teens may see antidepressants as less risky because they are prescription medications. There have been reports of hospital visits associated with teen antidepressant overdose or abuse. Altered cognitive, social and emotional skills during adulthood. Increased risk of drug addiction during adulthood. If these types of symptoms are present and an addiction is suspected, the antidepressant do not discontinue the antidepressant abruptly. This can lead to serious withdrawal symptoms. Contact a professional who specializes in substance abuse treatment. If you or someone you love is struggling with antidepressant abuse, call 1-888-319-2606 Who Answers? to speak with a treatment support specialist.
. Takayanagi Y1, Spira AP, Bienvenu OJ, Hock RS, Carras MC, Eaton WW, Mojtabai R. (2015). Antidepressant use and lifetime history of mental disorders in a community sample: results from the Baltimore Epidemiologic Catchment Area Study. J Clin Psychiatry 76(1):40-4.
. Anderson HD, Pace WD, Libby AM, West DR, Valuck RJ. (2012). Rates of 5 common antidepressant side effects among new adult and adolescent cases of depression: a retrospective US claims study. Clin Ther. 34(1):113-23.
. Rincon-Cortes M. (2014). Adolescent Prozac administration exerts antidepressant-like effects in adulthood by reducing ERK2 signaling in the VTA. J Neurosci. 34(20):6719-20.
. Evans EA, Sullivan MA. (2014). Abuse and misuse of antidepressant. Sub Abuse Rehab. 5:107-120.
. El-Mallakh RS, Gao Y, Jeannie Roberts R. (2011). Tardive dysphoria: the role of long term antidepressant use in-inducing chronic depression. Med Hypotheses 76(6):769-73.
. Bailey B, Buckley NA, Amre DK. (2004). A meta-analysis of prognostic indicators to predict seizures, arrhythmias or death after tricyclic antidepressant overdose. J Toxicol Clin Toxicol. 42(6):877-88.
. McKenzie MS, McFarland BH. (2007). Trends in antidepressant overdoses. Pharmacoepidemiol Drug Saf. 16(5):513-23.
. Ansorge MS, Hen R, Gingrich JA. Neurodevelopmental origins of depressive disorders. Curr Opin Pharmacol. 7:8-17.
. Barry CL, Busch SH.(2010). News coverage of FDA warnings on pediatric antidepressant use and suicidality. Pediatrics 125(1):88-95.